Nutanix Flow simplifies network and policy management with a focus towards applications – enabling applications and environments to be governed independent of the physical infrastructure. Delivering advanced networking and security services that allow enterprises to gain visibility and granular control of their enterprise applications, leading to better application function and security posture. Protect against advanced threats that are capable of propagating from machine to machine by segmenting virtual networks and applications to permit only necessary communications between application tiers or other logical boundaries via native stateful VM firewall. With nothing additional to deploy. VMs are ready to protect. Application policies are granular, easier to create, and support app mobility. Policies automatically update when VMs are provisioned, change network configuration, power state or migrate. Create granular policies based on minimally required network flows between application components to limit malware’s ability to spread. Take the mystery out of network policy creation. Before policy can be created and enforced the behavior of a application must be understood. By allowing the policy owners to visualize the discreet communications between VMs that make up an application, that understanding becomes possible. Creating policies for the allowed traffic then becomes a simple repeatable process. View and understand VM and application network communications. Create policy automatically based on real-time visualization of communications between applications and VMs without application domain knowledge. 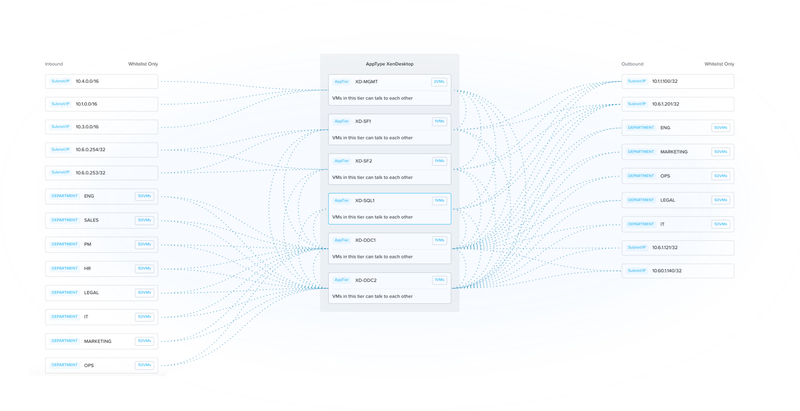 Fully integrated into the Nutanix platform, Flow delivers powerful networking and microsegmentation functionality with an intuitive policy creation and management interface that allows IT teams to easily visualize and secure the most complex enterprise applications. Software defined networking allows easy extension of network functionality via third-party software integration. Nutanix allows partners to enhance the Enterprise Cloud by inserting their functions in-line between virtual machines or leverage API integration to automate common networking actions. Services are inserted in-line with VM traffic. Common network functions include virtual firewalls, load balancers, threat detection, and application performance monitoring. Observe VM lifecycle events enabling automation of typical network configuration changes, such as the provisioning of VLANs and dynamically updating firewall and load balancer policies.